If you know what a Marvel Stripe and a Dr. Carolyn are, then you’re better than me. 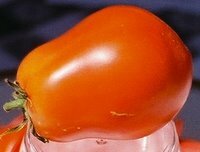 For those of you who don’t, you need to have a look at the Tomatoes picture reference page, hosted by D. Landreth Seed Company. Amazingly they have been selling seeds since 1784. By the way, if you’re curious why I picked those varieties to mention, it’s because the Marvel Stripe is the Mexican equivalent of a beefsteak and is the largest of variegated tomatoes, weighing over two pounds each! And the Dr. Carolyn is supposedly the best tasting of all tomatoes, and sadly I’ve never tasted one. posted by Lon	at 01:50 PM	Filed under Basics. You can follow any responses to this entry through the RSS 2.0 feed. Both comments and pings are currently closed. I love tomatoes, especially the heirloom variety. I just recently started growing Cherokee Purple tomatoes in my winter greenhouse.